Canada’s Natural Sciences and Engineering Research Council of Canada (NSERC) has awarded Sault College and Soo Mill collaborative research and development grants for their innovative robotic technology. A joint project between academic researchers and company personnel, the two partners have created a robotic lumber sorting and placing application to test how the automated process would integrate with and function within Soo Mill’s existing truss plant. The Natural Sciences and Engineering Research Council of Canada (NSERC) has awarded Sault College and Soo Mill Canadian technology grants. The Natural Sciences and Engineering Research Council of Canada (NSERC) is a federal agency providing resources, partnership opportunities, and research grants to support the development of new technologies and innovations. The agency supports Canadian innovators through two programs, NSERC Engage, for short-term research projects, and NSERC Collaborative Research and Development (CRD), for longer-term projects. Sault College, located in Sault Ste. Marie, ON is one of 24 publicly-funded colleges in the province of Ontario and is the largest deliverer of apprenticeship training in all of Northern Ontario. As it participates in collaborative applied research projects, Sault College can help local and regional enterprises adapt new technologies and develop new and improved products and processes that enable them to be competitive in today’s global marketplace. Soo Mill is a leading building supplier in the District of Algoma. Its team supports all aspects of building projects, whether it is renovating a kitchen, constructing a new home, refurbishing a bathroom, or even the process of purchasing a home. Sault College and Soo Mill have received applied collaborative research and development grants from the Natural Sciences and Engineering Research Council of Canada (NSERC). NSERC grants were provided to develop and demonstrate the ABB industrial robot, a robotic lumber sorting and placing application which was tested with Soo Mill’s current automated process in their Sackville Road location in Sault Ste. Marie. The test was performed in Sault College’s Robotics Lab. The robotic lumber technology was successful; it understood the product data and replicated the picking and placing of numerous lumber components onto wooden pallets in agreement with the required process using a specialized gripper. In addition to the NSERC, the project also received support from the Ontario Centres of Excellence (OCE). This project initiative will help Soo Mill enhance its operations and increase output and remain competitive in a technologically advancing industry. As well, it has provided students researchers the opportunity to apply their knowledge in real life automation situations. Natural Sciences and Engineering Research Council of Canada (NSERC) is a government agency that offers several research and development funding programs to Canadian businesses. Among their suite of funding for innovation are NSERC Engage, which companies can access for short-term projects, and NSERC CRD for longer-term projects spanning a year or more in duration. NSERC Engage grants support new research collaborations between Canadian businesses and college/university researchers. Projects are to be short-term (4-6 month) research initiatives focused on solving a specific challenge faced by the applicant business. The program provides up to $25,000 in Canadian government grants to support short-term research and development projects. NSERC Engage accepts rolling applications which means there are no deadlines. Typically, there is a four- to six-week turnaround on approvals. The NSERC Collaborative Research and Development (CRD) program supports collaborative research where a professor and their team of students provide research and development services over a period of one to five years. Through the program, companies can break through innovation challenges and generate new products, processes, and services with the help of post-secondary researchers. NSERC CRD funding offers companies up to 50% of eligible project expenses to a maximum of $200,000 per year in Canadian research grants. NSERC CRD accepts rolling applications which means there are no deadlines. 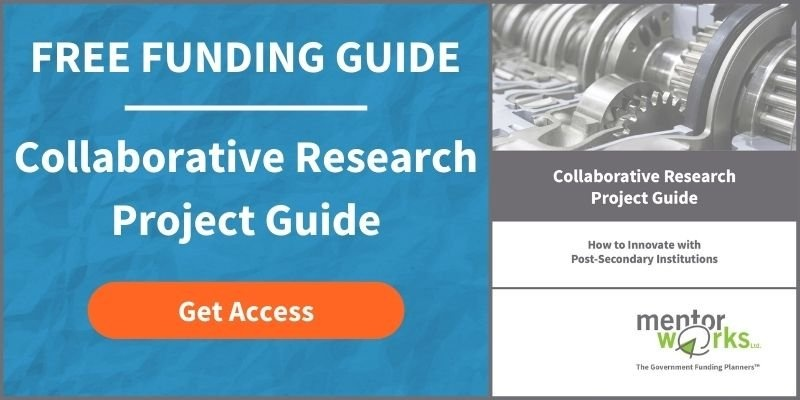 To learn more about funding for industry-academic research partnerships, please download Mentor Works’ Collaborative Research Project Guide.